Before there was Dragon Age: Origins, people would immerse themselves in the medieval fantasy world of knights and elves via the tabletop games of Dungeons and Dragons. And before there were medieval fantasy anime titles such as Scrapped Princess, Claymore, and Spice and Wolf, anime fans had Record of Lodoss War. 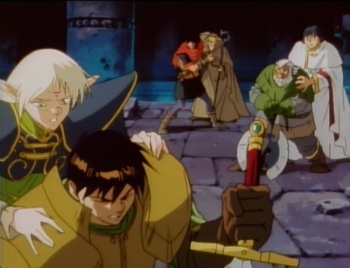 Even though Record of Lodoss War talks a little funny, wears clothes that went out of style 20 years ago, and walks with a cane, this granddaddy of medieval fantasy anime still has enough fight to kick those younger whippersnappers around. Based on a few replays of Dungeons and Dragons, the Record of Lodoss War is a history lesson into the fictional medieval world of Lodoss. Kayla the Grey Witch manipulates the kingdoms of Lodoss to war with each other, which makes life difficult for the peasants residing in those kingdoms. Several brave heroes band together to lend a fighting hand in the war, confront Kayla to end her influence, and eventually triumph over evil to usher in a new future for the land. Those familiar with Dragon Age: Origins or Dungeons and Dragons will quickly become familiar with the main heroes consisting of Parn the young knight, Deedlit the mystical elf, Ghim the grizzled old dwarf, Etoh the gentle cleric who is also Parn's best friend, Slayn the wise magician, and a conniving thief named Woodchuck. They all look and act like the character creation pages used in role playing games. The first episode feels like an animated play by play commentary of a tabletop gaming session as the heroes explore some ruins, encounter low level creeps, loot treasure, use the perks inherent in their character classes, and do a dexterity roll to escape from an angry dragon. After that introduction, the remaining 12 episodes tell an epic tale through the kingdoms of Lodoss. Like any leading protagonist in a role playing game, Parn starts off inexperienced as he receives thrashings from enemies and mentors alike. But as he gains experience he also gains allies and valuable treasure to help him become the hero he is destined to be. The rest of the heroes bond and grow friendships while dealing with personal gains or righting past wrongs. These characters present really keep the story interesting. The story is very much in tune with Tolkien and most of the tropes of medieval fantasy, which is one of the potential problems of Record of Lodoss War. There are many characters to meet, places to visit, and convenient magical relics or monsters that give their owners demi-god powers to keep track of. The pacing slows as the politics behind the war attempt to show every side in a positive light, though in the end it still boils down to "what the heroes are doing is right. and those who oppose will lose." Such expository elements can turn off viewers uninterested in the medieval fantasy genre. On the other hand, these expository elements are well executed and are usually the selling points for viewers who love medieval fantasy. Being 20 years old, Record of Lodoss War definitely deserves to be called old-school anime and may be older than most of the current anime fanbase. Being older and set in its ways, it is a reminder of what began trickling into US video stores before anime caught on like wildfire and is now readily available. Record of Lodoss War emphasized story and character development instead of character merchandise. Its dramatic and melodic soundtrack brought heartfelt emotion to the series instead of a dance routine for fans to reenact during conventions. Too bad those 20 years also highlight how much the series has aged. While people will debate the merits of English dubbing in anime for years to come, it is hard to disagree that dubbing was not really good two decades ago. While Deedlit and a few other characters are great, Parn and most of the men are pretty bad at emoting. The animation is dated to the point that I swear to seeing dust and cobwebs in some frames. It gives the series its old-school charm but most of the fighting scenes are not so stellar. But Record of Lodoss War still has a timeless quality that remains good despite a few wrinkles. At the very least, it is another lesson in anime history. Bottom Line: Memorable characters set in a medieval fantasy world of magic and political intrigue gives Record of Lodoss War the feel of an animated role playing game without blatant game merchandising tied to it. Recommendation: Record of Lodoss War is a great fit for Tolkien or role playing game fans, though it is a harder sell for those uninterested in medieval fantasy. Tom Tonthat still remembers his first exposure to Lodoss War thanks to Record of Lodub Warz II, a fandub parody about a band of insurance salesmen closing a tough sale.